Land a new 6 figure executive job faster! How much would it help you to know some of the secrets of executive job search success that I’ve learned, over my 25+ years as a career professional?
. . . The things I share with my job seeking clients that can have a HUGE impact.
. . . The smart strategies that have propelled them to land new jobs faster. 20 Little-Known, Insider Tips to Accelerate Your Executive Job Search . . . and Land a 6 Figure Job Faster! The best way to use job boards? The answer may surprise you! How to use a rejection to land another job at that same company? Why the way you structure your resume matters? How to connect with people you don’t know on LinkedIn? Why you should think twice about using free email services (Gmail, Yahoo, etc.) in your job search? How to get the benefits of Twitter by investing just minutes a day? If you answered “NO” to any or all of the above, you need to get your hands on this book now. To give you a taste of what to expect in the book, read a popular blog post of mine that comes directly from the book, The 3 Most Important LinkedIn Profile SEO Places for Relevant Keywords. In the book, you’ll also find a fourth important place on LinkedIn to use keywords to boost the Search Engine Optimization (SEO) of your profile – meaning more people will find you on LinkedIn. “Meg Guiseppi is one of the very few people I listen to carefully on career management issues. Martin Yate, CPC of KnockEmDead.com and author of the N.Y. Times bestselling Knock ‘em Dead series of career books (two featuring Meg as part of his “Braintrust” panel of experts). “Meg, your new book is excellent! 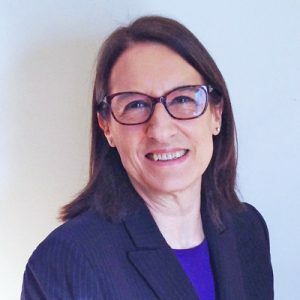 Susan P. Joyce, online job search guru and publisher of Job-Hunt.org, rated “Best of the Web for Careers, Job Hunting, and Finding Work” by Forbes and US News and World Report. “I honestly loved this book! 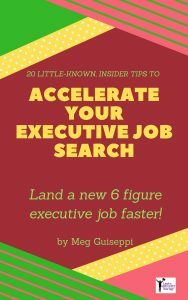 Meg spills the beans on the job search secrets most executives don’t know about- giving you the competitive advantage! “Meg has always provided a treasure trove of good advice for job seekers, and this guide is no exception. “This ebook should be required reading for all executives in a job search! Meg Guiseppi is “the bomb” when it comes to career experts. Her straight-forward delivery style and keen insight into the needs of executives in job search make this an essential (and quick) read for your kindle or nook. In fact, I read it cover-to-virtual-cover in about under 45 minutes and then went back to specific sections that I found to be creative and unique. Speaking of which, I love how Meg advises executives to capture accomplishments: with the WOW! results first! “As always, Meg Guiseppi’s advice is spot on! Katherine E. Simmons, CEO of Netshare.com, an executive community helping members achieve job search and career success. The tips in the book are important, (mostly) quick and easy strategies that will help you land faster. To help you even more, I’ve included a bonus tip at the end. You’ll actually get 21 winning strategies that can position you ahead of the competition! From my experience, most executive job seekers do not know these things. That means that your competitors probably don’t know these things either. Once you read this book, you’ll be better informed than they are. If you incorporate these tips into your job search, you’ll have a significant advantage over them. Many of the tips will take you longer to read than to actually put into action. That’s because, along with each tip, I’ve detailed WHY they’re important – some with short and sweet explanations, some with greater detail. Don’t you hate getting a tip and not knowing why it’s important? Your order is placed through a secure server. Once your credit card payment is captured, you will automatically be presented with the download link for the ebook. You will also receive an email with a link to the download page, in case you didn’t download from the page you received right after checkout. The ebook is emailed to you as a PDF file to download and open. Most systems will automatically open the file in Adobe Reader or another PDF reader, but if that doesn’t happen, you may need to download the (free) Adobe Reader. When you open the PDF file, you can adjust the screen view and size for easiest reading. And, you can print out the PDF file, if you wish. There’s no waiting for your ebook to arrive by snail mail! Start reading and learning right away! The sooner you order, the sooner you can get your executive job search on track. “This book is excellent! Almost as soon as I started using Meg’s LinkedIn tips, I saw results. More of the people I wanted to were viewing my profile, and I got better response when I reached out to my LinkedIn connections. “I love this book! So many tips here I didn’t know about. “I wish I had this book when I started my search a few months ago. Purchase the book now for only $19 and download it instantly. I am so sure my ebook will provide you with valuable tips and resources to help you land a great-fit job faster, that I’ll refund your purchase, if it doesn’t meet your expectations. Just email me directly [meg at executivecareerbrand.com], include your name and mailing address, and I’ll send you a full refund. No questions asked. You really have nothing to lose by purchasing this ebook — but so much to gain! Are you ready to advance your job search to the next level? Start incorporating these critical tips and get your executive job search on the right track. And get a great discount on my executive job search worksheets when you also purchase one or more ebook. Read more and purchase here. Here’s to your job search and career success! Featured and quoted in Forbes, Huffington Post, Fast Company, Wall Street Journal’s FINS, Inc.com, Fortune, CMO.com, PBS’ Next Avenue, About.com, Examiner.com, and others. Please note: By purchasing this ebook or any other product(s) offered here, your email address may be added to the Executive Career Brand newsletter emailing list. Of course, you may unsubscribe at any time, by following the “Unsubscribe” link at the bottom of each newsletter. Be assured that Executive Career Brand will never sell or share your contact information with any one.